Chaplin Bay is a small, quiet beach situated between Stonehole Bay and the more popular Horseshoe Bay. It’s much quieter than its western neighbour and you’re likely to find yourself with little company. It’s the perfect location to relax, unwind and read a book. The pink sands are partially divided by a coral wall and surrounded by cliffs. Between February and October look out for the white-tailed tropic birds (longtails) swooping in and out of the cliff-side nests. 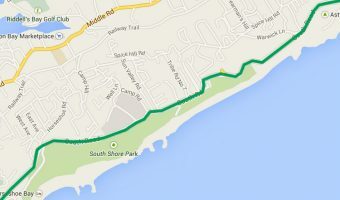 Chaplin Bay is situated in Southampton Parish, just off South Road. It’s part of South Shore Park, a long coastal park encompassing some of Bermuda’s best beaches. They are linked by a path running through the dunes behind them. Bus number 7 runs between Hamilton and Royal Naval Dockyard and stops near the entrance to the beach. There’s a free parking lot for those travelling by scooter. Chaplin Bay has restrooms but no other facilities. Follow the beachside trail west for around ½ mile and you’ll come to Horseshoe Bay, which has showers and beach concessions. The beach can be used as a venue for wedding ceremonies and other events. For details contact the Department of Parks. Map showing location of Chaplin Bay. This is one of several beaches you can reach from Horseshoe. It’s well worth the walk but make sure you’ve got some decent shoes. We went to Horseshoe and thought it was too busy. Then caught a bus to Jobson Cove and that was packed too. Ended up here. Should have actually walked there from Horseshoe in the first place, but wasn’t to know. It was a good place to snorkel. Liked this beach a lot and went back again the following day. There was a man renting beach chairs on the first day, but didn’t see him around on the second day. Video showing tourists enjoying themselves on Chaplin Bay. 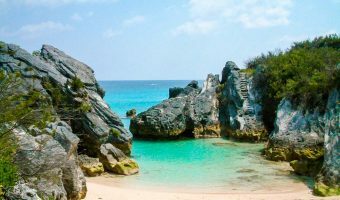 Our favourite beach in Bermuda. Sheltered and great for kids.